Get to know the 2016 South Carolina Chef Ambassadors. 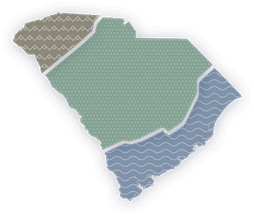 Follow along as they share some of the culinary secrets of the Palmetto State, from where to find the best locally sourced products to their favorite restaurants. Teryi Youngblood discovered her love of cooking at a young age thanks to her grandmother. Now she is known for her use of fresh ingredients and love for locally sourced products. Orchid Paulmeier, owner and chef at One Hot Mama's American Grille, is living her American dream on Hilton Head Island. Enjoy ribs, barbecue, steak, wings and much more at One Hot Mama's on Hilton Head Island. Ramone Dickerson says it best, "I think Southern food is kind of like the hearbeat of US cuisine." 2 Fat 2 Fly is a food truck in Columbia, South Carolina that serves one-of-a-kind stuffed chicken wings and other unique Southern dishes. Forrest Parker, Executive Chef of The Drawing Room, draws his culinary inspiration from the rich history and culture of the Lowcountry. The Vendue offers guests unique dining experiences at their three distinct dining settings, which includes The Drawing Room, The Rooftop and The Press.